Once or twice a year my father drove our family from the farm in north Florida for weekend visit to my relatives in Daytona. Our travel always took us through Palatka. This was a highpoint of my trip because I loved the bronze statues of service men with the eagle sitting on top of the bronze globe at the top of the arch. It’s the Memorial Bridge across the St. John’s River and was erected to the memory of soldiers and sailors of Putnam County, Florida. Each time we crossed the long concrete bridge, I sat enthralled by the miles and miles of vessel laden river. My father would casually remark that the soldiers were all taken down twice a year. Of course–as he knew I would–I’d always ask why. “So they can pee and have a bath.” As you can see, I’m not entirely responsible for my coarse–some might say crude–sense of humor. I respond best to the simpler themes of uncelebrated people and animals, caught in simple and everyday events. Those that tell a story of sorts. I like this lion because the artist made it look so easy that I could do it myself if I just had a big enough rock and a hammer and chisel. The Lion of Scotland it’s called, by Ronald Rae, is the traditional symbol both of power and of Scottish identity. It once stood between the royal palace of Holyrood House (Edinburgh Castle) and the home of the Parliament, but it was moved in 2010 to the St. Andrew Square Garden in the middle of Edinburgh where I took this shot. If you’re looking to buy a lawn sculpture–perhaps as a Christmas gift or as a means to publicly denote your Scottish heritage–this one is for sale. Be advised, though–for shipping purposes–it’s sculpted of granite, is about 8 x 17 x 7 feet in size, and it weighs 20 tons. Gretna Green is a small town in Dumfriesshire County in Scotland on the road south from Edinburgh to northwest England. It’s biggest claim to fame, as far as I can tell, is the number of marriages performed there every year. Parliament passed a law in England in 1753 requiring parental consent for anyone under 21 years of age to marry. In Scotland, the legal age for marriage was 14 for boys, 12 for girls–with or without–parental consent. Obviously, these conflicting ages of consent caused a lot of problems for irate parents, and Gretna Green soon became famous for runaway marriages. Another peculiar Scottish law at that time, that allowed anyone to perform marriages, led the two blacksmith shops to begin performing marriages there to earn extra money. They quickly became known as anvil priests and were very popular for eloping couples from England. According to an online Gretna Green wedding history, young couples often were chased by at least one set of angry parents, and that on occasions the ceremony would be halted and the young couple hustled into the nearest bed. When the angry father found the couple in bed together he would head home in disgust, thinking he was too late. Once the father had gone, the couple would then continue with their wedding. Moving on to Limerick in Ireland, I’m reminded of Frank McCourt’s Angela’s Ashes, and it actually is the setting for both the book and the movie. It may be the vividness of detail McCourt recalled in the book that color my impression, but oh well. To me it will always be a depressing place. The fact that it was raining during the one night we spent there did not help either. Neither does this statue of a hurling player and a rugby player on a downtown street in Limerick do anything to dispel my overall impression. For the sake of the people who live there, I hope I’m wrong. To say I am not a sports aficionado would be an understatement. Except that apparently the people of Limerick love football–all kinds–I find no romance in violent sports and, alas, no story either. Dublin is a different story. Except for its busy-ness that I generally disliked, I found it quite a colorful place. I wish we’d had more time for exploring there. Much of its charm I attribute to those wonderful doors of Dublin all around the city, and Molly Malone the lass who wheeled her wheelbarrow through streets straight and narrow singing cockles and mussels alive alive-o, designed by Jeanne Rynhart. It’s quite rare, I understand from the locals, to find her all alone without tourists posing next to her, but here she is. Gee, now I wonder why her breasts are not as dark as the dress she’s almost wearing? 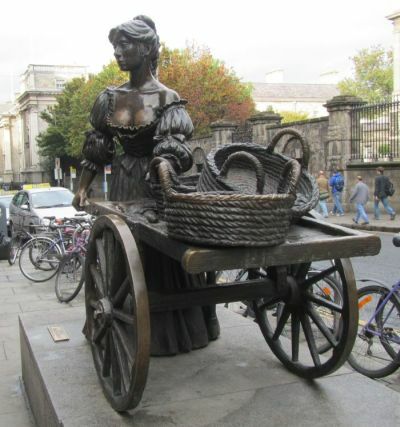 Our local guide, a quite proper looking woman, I thought rather gleefully pointed out her various nicknames among Dubliners: Tart with the Cart, Trollop that sold Scallops, Dolly with the Trolley, Dish with the Fish, and Flirt in the Skirt. Backtracking a tiny bit here, Chester was by far my favorite town in England. One of its most unique features is the nearly two-miles of walls surrounding most of the city center that makes the most complete Roman and medieval defensive wall system in Britain that served as inspiration for artist Stephen Broadbent’s Celebration of Chester sculpture I found near a tourist information center just outside a shopping mall. The three intertwined bronze figures symbolize three important aspects–thanksgiving, protection, and industry–that reflect the personal and corporate life of the city. Nearby we found this baby elephant that looks so real, our first impulse was to reach out and stroke it. I wanted to take it home with me, but decided to capture this image instead. 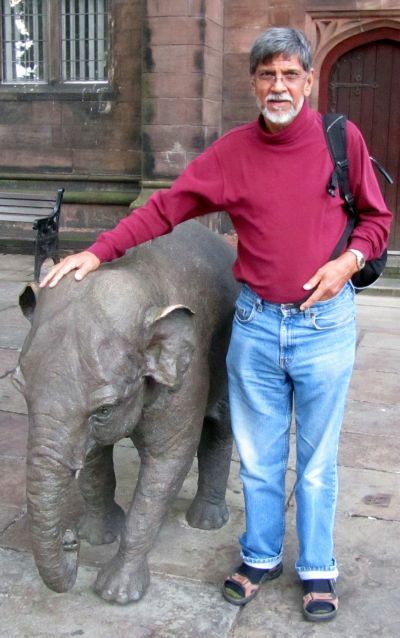 Its creator, Anna Yarrow, grew up in India in the 1930s and 1940s and thus has first hand knowledge of elephants. Remarkably lifelike, this bronze beauty was a gift from the Chester Zoo to celebrate the friendship between the zoo and the city of Chester. At this point, I’m realizing the futility of placing 15/16 pictures into one post. Rather than leaving some out, I should stop now and leave the remaining ones for another post. In the meantime, friends of ours recently returned from a visit to Chicago, shared pictures of a couple of new pieces of public art they saw there. Just to show the U.S. will not be left behind in the premise of public art, I share one here with you today and hold the other, my favorite, until the next post. I hope you’ll come back and see it another day. According to Wikipedia, Cloud Gate, a sculpture by Indian-born British artist, Anish Kapoor, is the centerpiece in this loop community area of Chicago. From another angle you can see a 12-foot-high arch providing a gate to a concave chamber beneath the sculpture, inviting visitors to touch its mirror-like surface and see their image reflected back from a variety of perspectives. 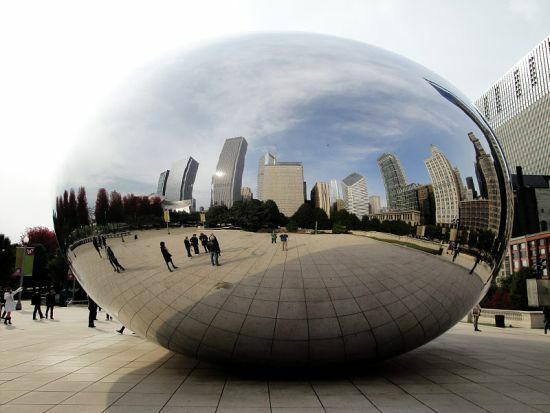 Chicagoans immediately dubbed it The Bean because of its bean-like shape. It’s made up of 168 stainless steel plates welded together with highly polished exterior with no visible seams. Pretty fantastic, huh?! In the Scottish Gaelic language, to which we would be introduced soon enough although we didn’t know it at the time, Scotland’s Edinburgh airport’s name is Port-adhair Dhùn Èideann. Language was to be a source of great amusement for both Hubby and me during our 16 day trek across the United Kingdom as you’ll see in later posts. As our flight circled in preparation for landing, I was glad I’d taken the window seat in the KLM Cityhopper we’d boarded in Amsterdam earlier that morning. I’d read enough novels by the Bronte sisters and Jane Austen and seen enough movies set in the UK that I think I’d formed an impression of how Scotland and Wales probably looked. Something hauntingly beautiful but somewhat depressing at the same time, as in the introductory photo above featuring the Pentland Hills near Edinburgh. And the weather, I just knew, would be dismal and terrible too. But I would be wrong. 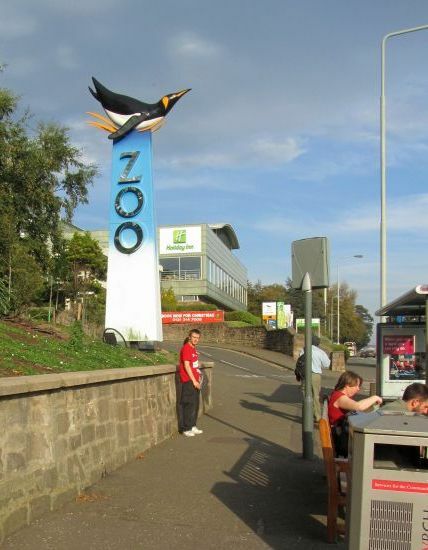 That’s our hotel, the Holiday Inn (behind the zoo sculpture), this one located on Corstorphine Road in the Pentland Hills area of Edinburgh–just three miles from both the city center and the airport. True, the skies do look cloudy, but this was snapped September 30, and you can see by the way people waiting for the bus are dressed that the temperatures are almost balmy. The man behind the bus post with the backpack is Hubby, which will clue you on the type of clothing we both packed for the trip. On the advice of Grannymar, our blogger friend from Ireland, we’d gone prepared with layers which would normally serve us well this time of year, whether in this country or Europe. The problem was the bottom layer I’d packed–mostly knit pullovers over which sweaters, jackets and raincoats might be worn or a scarf added. Living in a dry climate the past 14 years, I’d forgotten how hot cotton knit can feel in high humidity and warmer temperatures. Just our luck that the whole of the UK was experiencing record high temperatures at around 30°C. (A quick way to convert Celcius to Fahrenheit is to double the number, then add 30. So that 30°C figure translates to around 90°F or close enough!) After a day or two I was praying for colder temperatures and resorted to wearing a short-sleeved t-shirt I’d brought along to sleep in. It very old (1988 vintage LTD), much too large for today’s fitted styles, and printed with bright blue fish. I decided it was better for people to assume I was fashion-challenged rather than crazy for wearing turtlenecks and long sleeves. 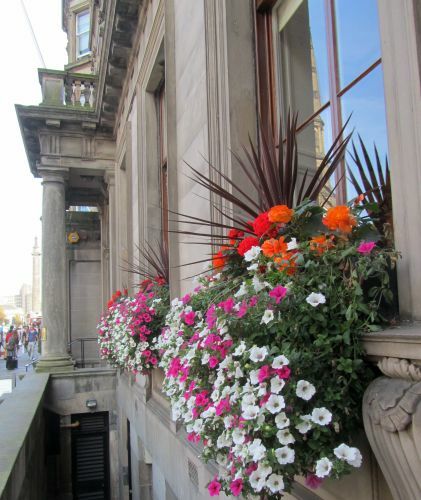 Many things about Edinburgh impressed me–stunning architecture, cobblestoned streets, the pubs on nearly every corner offering inexpensive but tasty food and drink, charming tea shops and bookstores, just the general charm and personality of the city, as reflected here in this close-up of just one of the hundreds of balcony gardens. Just as we were in India earlier this year, both Hubby and I enjoyed the ease and speed with which we were able to get about the city. Buses ran every 5 to 10 minutes until late in the evening when they were a little further apart, and for about the cost of two one-way tickets, you could get an all-day pass that allowed you to go all over the city as often as you liked. We were only there for two days, but when we weren’t on a guided tour on the Coach, we were happy to get about on our own. And the people we met! On one of our bus excursions, we met a charming little girl of about 10 years who was riding in the upper berth alongside us. She was riding herd on two younger brothers, one of whom was nicknamed Monkey, she informed us, he was such a climber. That’s why they were on the upper deck. Her aunt who they were visiting sat a ways behind with the baby brother. 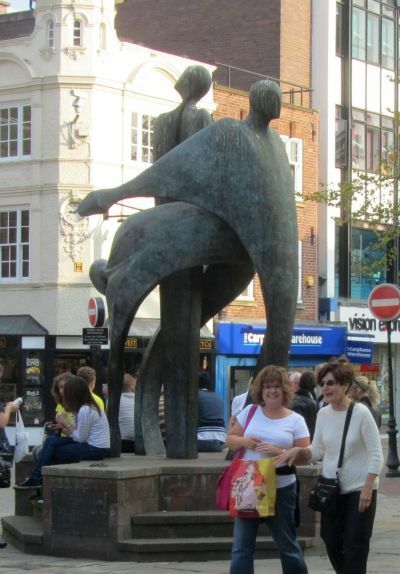 The whole family were in town visiting relatives for her father’s birthday. They were getting a cake and planned to celebrate that evening. They were looking for his birthday present. She went on to tell us all about them with such candor: which village she lived in, where she went to school, her grades and how smart her father thought she was, and which she unabashedly acknowledged. Bearing not even a hint of pretentiousness, totally comfortable, the little girl and her family was but one example of the friendliness of the locals we would encounter throughout the trip. I must add, however, that since we understood only about every other word, it’s a good thing she was so prolific. 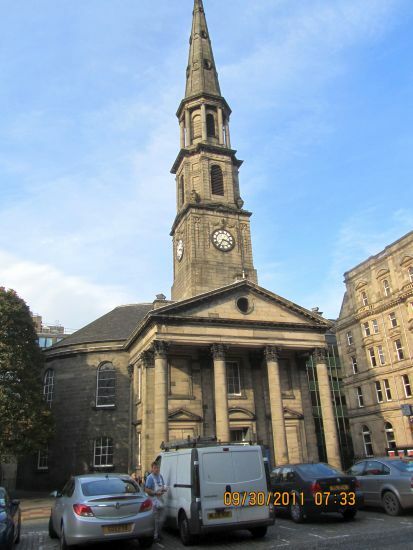 Here’s just one example of one the churches of Edinburgh. It’s the St. Andrews and St. George Parish Church of Scotland on George’s Street. The architectural style of the bell steeple and entry reflects the contemporary 18th century fashion for classical Roman forms and includes the “temple front” style portico with ceiling rosettes and clock. I chose it to show here because of–you guessed it–the stories around the shorter, round dome you see just to the left of the entry. According to our tour guide, the parishioners have two explanations for building the assembly hall in this round shape. One is that the Devil has no hiding place without the corners; another is that no one can hide when the collection plate gets passed. Last but not least, let’s finish up with kilts. A Scottish kilt is a pleated, traditional outfit worn by the Highlander clansmen for hundreds of years. Yes, they are still worn, although the “traditional” plaid kilt wasn’t around until the eighteenth century. Before that Scotsmen wore knee length plaid shirts belted in the middle because they were too poor to buy pants. Yes, there is a protocol associated with their wearing. First of all, they are most worn by the highlanders (northern Scotland), and then only or especially at special occasions. I snapped this picture of wedding guests taking a break outside the church. The waistband should fit comfortably but snugly high on the waist, right below the lowest of the ribs. It should fall either at the knee or brush the top of the kneecap. The tartan, or plaid, pattern should reflect the traditional pattern of the ancestral clan, but if you don’t have a Scottish background, you might use a more universal tartan. (Google: Black Watch, Royal Stewart or Jacobite pattern for examples.) Appropriate accessories? A sporran is the leather pouch, used as a pocket, worn on a strap or chain that hangs in front from the waist over the groin area. Hose is worn in black or cream–never white. Black was originally for funerals, but is now a popular choice for everyday wear, while cream is best for evening or formal occasions. Ghillie brogues, which look like black and white boots, are the shoes of choice, while black or brown leather loafers–appropriate to the occasion–can be worn. The traditional kilt jacket is a “Prince Charlie” jacket, appropriate for weddings and other formal events, but for daywear or less formal events, a sports jacket, tweed jacket or even a sweater is appropriate. As usual, I saved the best for last. 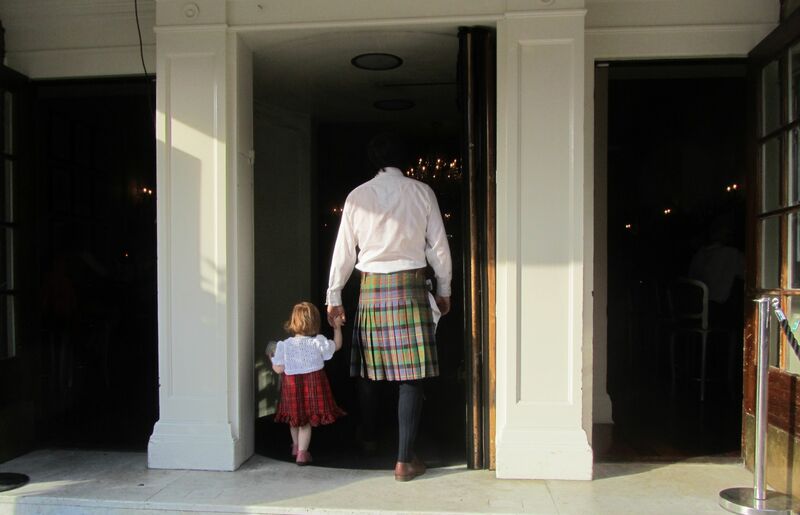 How do you think these kilts–girls wear a kilt too, sometimes!–measure up to your new knowledge of kilt protocol? It’s not exactly the best quality, the picture I mean, but it’s what you get when you aim fast and low for that candid shot, and the perfect impression of our first full day in Scotland to leave you with. Next up, a discussion about castles and things. 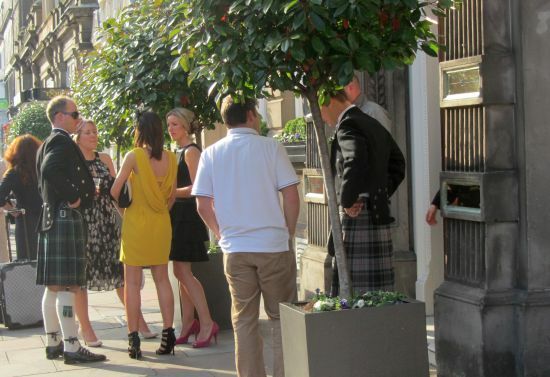 Well, it was gratifying to see that kilts are still in fashion in Scotland. 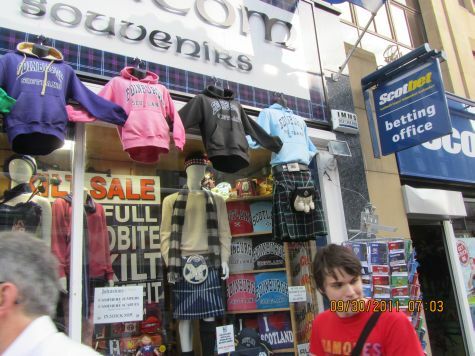 You can even buy one in souvenir shops like this one somewhere along Prince Street in Edinburgh. I tried to talk Hubby into getting one. It would have gone so well with the “Don’t Mess With Texas” Tee Shirt he was wearing! He refused. I guess he just wasn’t in the buying mood. The kilt jokes probably get very old to tour guides all over the UK, but that didn’t keep ours from entertaining us with several during our early morning tour of the city. I’m sure it’s well known that every Scotsman worth his salt wears his kilt with nothing worn beneath, and the classic answer to the question being there’s nothing “worn” at all beneath the kilt, Madame. Everything is in perfect working order! And one could tell as he walked that he’d drunk more than his share. And stumbled off into the grass to sleep beside the street. 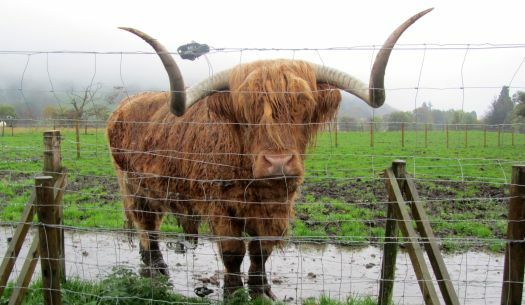 “See yon sleeping Scotsman, so strong and handsome built? Lifted up his kilt about an inch so they could see. Was nothin’ more than God had graced him with upon his birth. They marvelled for a moment, then one said: “We must be gone. Around the bonnie star the Scotsman’s kilt did lift and show. Now the Scotsman woke to nature’s call, and stumbled towards the trees. Behind the bush he lifts his kilt, and gawks at what he sees. Now that the kilt jokes have been dispatched, we can go on to more serious things in my next post about Scotland. Actually, there is a strong protocol involved in wearing kilts. I’ll talk more about that along with sharing more candid kilt pictures.